mscha wrote: ETA: this is not my favourite pizza topping. But perhaps BlitzGirl would like it? Oooh, it's got a butterfly! Though, yeah, it might need to spend some more time in the oven. I'm a ham, pineapple, and cheese kind of guy, but chicken (with bbq sauce) is good also, pumpkin can be interesting, and I once had a very tasty eggs benedict pizza. Oh yeah and sundried tomatoes and mushrooms are great too. Ham is nice, I like that! Chicken, too. And you are also suggesting pineapple and pumpkin? Well, I guess I will try that too! Is that a North American thing? I've never seen a pizza with those before. Now I am curious. taixzo wrote: My favorite pizza toppings? Basil, garlic, artichoke, onions and kalamata olives. No cheese. Hmm, that combination sounds intriguing, especially since there's no cheese allowed? What kind of pizza is that? Well, I'll find out pretty soon! fhorn wrote: It's not always my favorite, but sometimes I just want to have a potato pizza. ETA: OK, this was not my intention. Now, let's have a new Papal decree: Post a silly prediction, do your own fanfic, or try to ONG. Last edited by BytEfLUSh on Tue Jun 18, 2013 12:02 am UTC, edited 2 times in total. azule wrote: Panorama Update. I start this leg from the snake detour. Neat! At this point it's been big enough we could make a click-and-drag out of it. Food for thought. I don't think we're doing parodies, so that's a problem. Weird Al basically remixes the songs he parodies, with either an opposing theme or a similar feel, with the end result that something is made fun of. We, I think, filk with more seriousness (even if they're fun and light). They're fan fiction, regardless of it being a story, a song, or an image. Even the data crunching is fiction as we're forced to look at ourselves in a new way that may not actually reflect reality (such as how post count doesn't account for short or image-based creative contributions). Or mix and match until goal word found. Our rope isn't strong enough. Hold this or you'll fall. Last edited by BlitzGirl on Tue Jun 18, 2013 12:23 am UTC, edited 2 times in total. the First Cleric wrote: Not only has he done it, but so has CasCat. The Pope looks blankly at him. the First Cleric wrote: The other BlitzGirl... The one you said you knew about? The Pope wrote: Oh, yes, that one. I think maybe you'd better tell me all about this now, rather than later. Where is this CasCat? the First Cleric wrote: She's been spending all her time with his Meojesty. The Pope wrote: edfel? I want a word with him also. About those... maps... of his. The Pope and the First Cleric exit stage right, as the First Cleric begins filling him in about the events of the past few days. The second scribe is left alone with the sixth cleric and the two BlitzRockets. The sixth cleric follows the second scribe as she walks over to Taixzo's craft to inspect it. the sixth cleric wrote: The Quest... did you find what you were looking for? the second scribe wrote: I think so. the sixth cleric wrote: And the Pope? If I may ask, how was he? The second scribe pauses a moment, and looks her straight in the eye. the second scribe wrote: Brave. At rise: A tent in the campsite. The back of the tent is open, facing the audience, so we can see inside. His Meowjesty edfel is cuddled up with CasCat. Upstage, the Pope and the First Cleric approach the (closed) entrance of the tent. The First Cleric addresses them from outside. the First Cleric wrote: Your Meowjesty - you have a visitor. edfel wrote: You ain't kiddin'! Go away. the First Cleric wrote: I mean... you have another visitor. edfel wrote: Is she cute? CasCat wrote: What am I? Chopped molpy? edfel wrote: I didn't mean it that way. Well, ok, actually I did mean it that way, but I didn't mean what meaning it that way means, if you know what I mean. the First Cleric wrote: It's the Pope. And he wishes audience with both of you. CasCat and edfel look at each other. CasCat wrote: It would be an honor. The Pope and the First Cleric enter through the tent flap, and CasCat bows before the Pope. Reluctantly, edfel follows suit. CasCat wrote: It is an honor to be even in your presence, your Pontiffness. The Pope wrote: No, it is the other way around. I am merely a Pope. You, however, have done something which is far more awesome and humbling. Is it true what they say - that you have Blitzed the entire thread? The One True Thread? CasCat wrote: Yes, indeed. It was a most wonderful and relaxing experience. I am far the richer for it. And also, by having done so, for meeting his Meowjesty. The Pope wrote: Yes, I have a few words for him myself. But that can wait until later. For now, I want to ensure that you get your proper and due recognition as BlitzGirl the Next. CasCat wrote: Oh, I already have. Or, I think I have. The First Cleric held a ceremony just the other day for me. There was a bit of pandemonium at the end though. The Pope turns to the First Cleric. The Pope wrote: Oh? You seem to have omitted that part. the First Cleric wrote: Well, there was so little time - I couldn't explain everything on this little walk here. CasCat wrote: Things got a little out of hand with the dancing, and then there was that berry juice something-or-other. The Pope wrote: I've heard stories, and I have a feeling I'll be hearing a few more in the next few days. CasCat wrote: I'm sure it's fine, but you have another party in mind, I never turn down a party. The Pope wrote: Good. I love a party too. So, it's settled. But I have one question for you. I am told that you Blitzed the entire thread in only one week. That's seven hundred pages. Is that right? CasCat wrote: Seven hundred thirty three, to be exact. The Pope wrote: A hundred pages a day! That's... well, that's not only a record, that is a whole new category! In fact, it's a whole new kind of category! CasCat wrote: Category. I like that. The Pope wrote: A lot can be accomplished in very little time, if you have the mind to put to it. Make ready the celebration! Tell the hearalds to sound the ram's horn the highest hills! This is an awesome day! The First Cleric leaves, and the Pope turns to edfel and hands him the map. The Pope wrote: Now, about this map. edfel wrote: It needed updating. The Pope wrote: Needed updating? We were on Holy Quest, and this obsolete map put the second scribe and I in great danger, perilous peril, and also a bit of a pickle. I was only able to save the day by looking out the window of the BlitzRocket and recognizing a few things from memory. Our second scribe deftly brought the craft home while I was glued to the window, telling her what I thought I saw. edfel wrote: It needed updating. The second scribe asked to borrow it; I didn't expect you to use it on Quest! The Pope wrote: Expect? Expect? This is a most Holy Quest! We must be prepared for anything! Even the Spanish Inquisition! The three of them look at the tent flaps and wait for it, but nothing happens. edfel wrote: Anyway, I have an updated map. Here. I've drawn lots more lines and labels and symbols and things. The Pope takes the new map from edfel, and looks at it. The Pope wrote: Very nice. Very very nice. I especially likes the lines, and the labels. And the symbols. And all the... things. edfel wrote: I couldn't have said it better myself. The Pope wrote: Now, if you both will excuse me, I have to make up some badly needed sleep before our pronouncements. It has been an honor. The Pope leaves through the tent flap, as edfel turns to CasCat. edfel wrote: Those things have windows? CasCat wrote: Yes, but I never use them. They show the outside. Very dangerous. The problem is, the roles are reversed. It's Cueball, not (presumably) Megan as in the dream, that is in danger of falling. I was interpreting it something like, those will be the last words Cueball hears before he plunges to his doom, etc. And that is my silly prediction for this post. Cueball's doom. DEATH EVERYWHERE in the OTC todip, apparently. I finally found some quiet time to read this properly. Marvellous, as always! BlitzGirl wrote: I was interpreting it something like, those will be the last words Cueball hears before he plunges to his doom, etc. And that is my silly prediction for this post. Cueball's doom. DEATH EVERYWHERE in the OTC todip, apparently. You've really gone over to the dark side, ever since the final chapters of The Last Time Waiter. Just tossing this out there as an idea but what about it lining up with the solstice? It looks like something big is going to happen soon (top of the mountain) and the solstice is only a few days away. Also the start of 1190 was March 25, just after the equinox. I could easy be way wrong, just tossing it out add an idea. Kudos on whoever (BlitzGirl) predicted the rope!! Indeed. With a little coding skills (or stealing of c&d's code) that could be done. Adding zoom-in spots too (like those scenery stone thingies in national parks). But the connotation wins. If I hold something to my breast, is that going to leave the correct connotation in the ear of a modern listener? So, long response short, we need a word that doesn't carry with it too much baggage. Is that where he's been? I know how hard it is to escape a snuggling kitty. eta: Sorry to hear you've had a bad day today, k.bookbinder. Hope a beautiful flutterbeesnake comes your way (no raptor, though, sorry Blitzgirl). Thanks fhorn! Ooh, I've always wanted to try making a potato pizza, but my wife will have none of it. I shall have to make one in secret, somehow, someday. k.bookbinder wrote: After de-coma'ing, I was very excited to see the appearance of the raptor (though a bit sad for the flutterbeesnake). And when it comes to feathered dinosaurs, I cannot help but put in my $0.02: it was a flycatcher. Since I cannot see the color, nor properly hear its song, this is a best guess. But its size and silhouette is correct, as is its feeding habit (if we are assuming that the encounter with the chirpies are the same species of raptor - which I am). For you Africanists, it could even be this bird. I'm not convinced about the flycatcher. I feel like the size and shape are wrong. But while looking at flycatchers I saw this guy, and he was so wonderful I just had to share him. k.bookbinder, I'm sorry it wasn't a good day. I hope everything's ok. It is always difficult to judge these feathered dinosaurs, based solely on a 2D silhouette. But I will state my argument for a flycather again by posting this. I think there was some discussion in regards to identifying the raptor by comparison of size to the flutterbeesnake that got munched. This video shows, what I believe, is a roughly similar size comparison between this particular species of flycatcher (and most others) and a reasonably sized moth that probably had pretty wings. By the way, that is a beautiful picture of a royal flycatcher. I am partial to flycatchers, as they are some of the most beautiful birds around the world, such as the royal flycatchers on Central and South America, and the Paradise Flycatchers of Asia and Africa. But to travel to Papua New Guinea and to see a bird-of-paradise, in person, in the wild - should I accomplish that I may shuffle off this mortal coil as a wonderfully happy man (that's not to say I'd like to die after seeing one, to be clear). k.bookbinder wrote: Today has not been a very good one. But it does cheer me up (as always) to see so many wonderful posts here. However, I am pressed for time, but shall obey the Papal Decree calling for pizza re-posting my blue pizza. Blue is not a normal thing for my pizza, but I do so love tomato slices, artichokes, onions, and mushrooms. Also, I tend to use provolone and mozzarella, and a drizzle of olive oil before baking. Sorry to hear you had a bad day... As soon as I get around my photoshop baking tools I will make you a nice pizza with your favorite ingredients! The way to do artichoke on pizza, in my humble opinion (which is never truly humble when stated as such), is to use marinated artichokes halves, then slice them thin and sprinkle around the pizza like shredded cheese (not as much, though). When paired with really tasty tomatoes (not bland supermarket ones) it makes for a wonderfully light tasting pizza. Which helps balance out other heartier flavors like olives, mushroom, and anchovies (yes! I like anchovies on my pizza). Thanks everyone! You've all cheered me up immensely, and I'm touched by your genuine concern (though not surprised ) Just one of those days at work. Speaking of bad days, Cueball on the end of a rope fills me with a certain amount of dread. Lest they are careful, Cueball's day may turn worse than my own. I literally fell out of my chair laughing at that. azule wrote: Kudos on whoever (BlitzGirl) predicted the rope!! I did sort of predict it too. I've been posting on and off all day─how can I have so much ketchup to spill? Perhaps to others it's obvious what she intended; for me, I can't help adding, Cupcakes for us! None of the usual terms seem quite to apply. Parody, pastiche, homage: these all include a comment on the original work, which we generally do not intend. Contrafactum* is too technical. Filk comes closest, even with its implications of F&SF fandom, because its usage has spread beyond the SF cons; I learned it through the Society for Creative Anachronism, literally around campfires. But we could use a term of our own, to go with the rest of the enormous vocabulary we've created. jovialbard suggested Timeody a few NP back, and I rather like that. Its clear link to the same Greek root as melody and threnody gives it more of a musical implication than is really appropriate, but nonetheless Timeody fits our dialogue here extraordinarily well. Angelastic wrote: I also liked that haiku a lot, but I feel like I should choose differently from BlitzGirl, so I will vote for taixzo's double dactyl, because pants often win me over. My favorite pizza toppings? Basil, garlic, artichoke, onions and kalamata olives. No cheese in my pants. 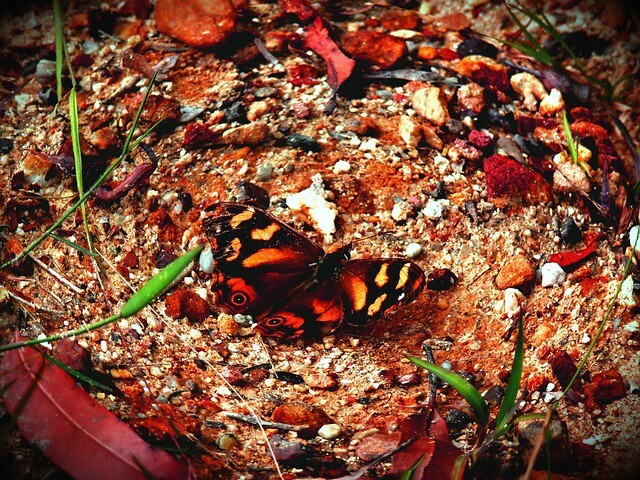 Earthling on Mars wrote: You're happy about the butterflymolpy's demise?! For all that you mourn the loss of the flutterbee as a symbol of beauty in the world, would you have mourned it so fiercely had it not met such an untimely end? I rejoice in the strength of the raptor's wings, its steep and plunging dive, its anticipation and judgement and technique. I celebrate it: wind-rider, air-splitter, acrobat on the breeze. It is a glorious engine of death, bringing the life of the flutterbee so precisely and poignantly to a close. Too often beauty lingers past its time, left behind on a newpix beyond our ken, to spiral into feather-soft memory that slips from our minds as gently as the Fading. No! Not here! Not now! The flutterbee is snatched from life in the instant of its appreciation, glorious, caught forever in a moment most beautiful, soaring gracefully into the heavens on glistening wings. It is our Icarus, breaking the chains of the earthly world in a brief, dooméd ascent. When he gazed into the blazing heart of the sun, what did he see? What if not the glory of a perfect unbecoming, a climactic close, an eternal legend, a symbol of life and loveliness and hope and desire caught forever in that instant of infinity before transcending the chrysalis of its physical shell and joyfully stretching newborn wings under a sky clearer and fresher than any mortal soul will ever know. You weep at the loss of a pretty bug. I weep for you, who cannot see how glorious it truly was. That was gorgeously said. Still, I can't help but picture Randall reading that and saying to himself, "I was just stealing a gag from the opening of Men in Black!" * Yes, all right, I just learned that word. See, for many years I would pass by the Cathedral three times a week and just stick my head in to see what might be going on. Lessons and revelations are presented regularly in the Cathedral of the One True Comic, but the teaching, discussion and philosophizing is conducted immediately adjacent in the Tabernacle. I would cast an eye in there occasionally as well. Others were equally taken and a congregation grew quickly; the group is pretty neat! It's a varied lot, and judging from the name tags I see, quite international and very urbane as well. Although there are some senior members, it seems the average age is young-ish. (Heavens, I think I own some cars older than many regulars.) For many reasons, some of the regulars have fallen away so I thought perhaps I should get up, get a name tag and join the congregation. I’ve noticed some other Cats here too, so maybe I’ll move up to another pew. You see, each hour another revelation is presented in the Cathedral. A parishioner picks up a copy of the new picture and posts it in the Tabernacle. At the sounding of the sacred ONG, as many as will then assemble in the ToT for speculation, discussion, and no little bit of tomfoolery. 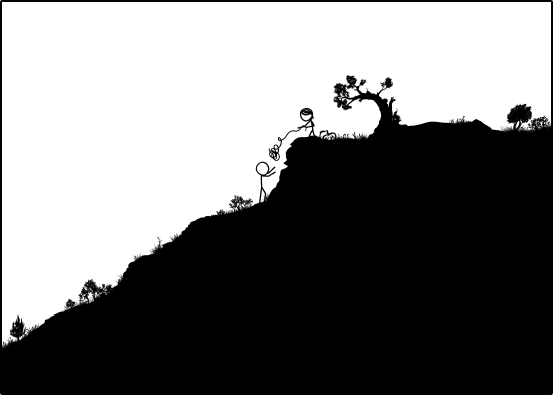 The series of pictures from the beginning comprise a story line of the two little characters on a journey. What we have seen so far is not so revealing that we can guess at the ending, and that is a large part of the happenings in the ToT. So, as admonished, we Wait for It. The congregation is SO varied that no firm doctrine (other than the initial commandment) has evolved. Most of the lessons come from discussions and reference to other writings. Should you miss an ONG, it’s hoped that you’ll perform the revered Ketchup by reading what you missed. If you've missed a lot, you may want to read all of the teachings in order. That's known as a Blitz and a long one may get you a hat awarded for merit. You wear it on your name tag. Hats are usually awarded for exemplary service to the faith, but also occasionally simply on request. The original Hatter has gone out of business but others have risen to the need. But what an easy going group; I mean they have sects and random texticles and everything! (Oooh, ahhh!) Many of the sects formed early when the early lectors were predicting how the story would unfold. Some think the tale will loop back to the opening frame; they are the Loopists. Others think it will go on forever (the Eternalists). Some say it will be a metaphor for something in Lord Randall’s life, and this I firmly believe. Therefore, I am a metaphorist. Other lectors and readers have said much the same. What’s more, the Literary sub-committee writes poetry and encourages a particular form know as double-dactyls. Most of the submissions are pretty good although some fall to Earth of their own weight. These of course become terradactyls and are not heard from again, a pterrible fate for such strong efforts. Join us at the church, Sis. When you get there, the password is “caffeinatedbaby…”, er, “raptorsemencancer…,” no, um it’s “molpy-beesnakeflutter…”. Oh, hell! – Just mention bacon and I’m sure they’ll let you in. I think most of the pizza posters assumed red sauce and mozzarella. You might edit to be sure folks get it. Last edited by charlie_grumbles on Tue Jun 18, 2013 1:08 am UTC, edited 1 time in total. You *bop*ped an Internet balloon so hard that it travels at 0.9c into the Sun while beaming all Earth-bound lasers towards the Moon? On the filk word replacement, seems most of you'all are limiting it to the songs. I think we're doing the "filk" for all of our content. I might not be able to convince youses. Ontopix: for some reason the rope throwing makes me giddy. A giant meowmolpy sees the rope, goes, "String!" and runs away with it, dragging Megball helplessly along. k.bookbinder wrote: Thanks everyone! You've all cheered me up immensely, and I'm touched by your genuine concern (though not surprised :wink:) Just one of those days at work. That's great! Though of course it'll work better once Cueball's on the other end of the rope. azule wrote: On the filk word replacement, seems most of you'all are limiting it to the songs. I think we're doing the "filk" for all of our content. I might not be able to convince youses. Ah. Then we're not even sprechen-ing the same language, I guess. I've never tried to group all creative OTT works under a single name. I've used "songody" a couple of times now for the song lyrics - probably will keep using that until I see a word I like better. Very strange: xkcd/1190 was serving up the previous newpix a moment ago and it has now switched back. I have no explanation, unless my browser reached into the cache somehow. jjjdavidson wrote: A giant meowmolpy sees the rope, goes, "String!" and runs away with it, dragging Megball helplessly along. That actually sounds quite plausible. But, I'd like to see the meowmolpy! My posted favorites work great with tomato sauce, pesto, or even a garlic white sauce. I tend to rotate sauces, but not necessarily toppings. If y'all think that this death-delighting mood of mine is something new, you'd be mistaken. See below for evidence. BlitzGirl wrote: If y'all think that this death-delighting mood of mine is something new, you'd be mistaken. See below for evidence. Oh yes, I for one certainly remember. Such a bad kittle! And with that, I bid youse farecoma. But that's Cueball, not some poor flutterbee. His suffering is delightful. So a prediction: Cuegan reach the homes of mountain people and are invited in for a meal. Megan thinks the food is 'interesting' and Cueball says "ugh". For all we know, that flutterbee was the Cueball of the beesnake world. After all, it did fly straight up into open air. That seems like a Cueball-esque move. Last edited by BlitzGirl on Tue Jun 18, 2013 1:57 am UTC, edited 1 time in total. Indeed! I remember that, though I had let it slip my mind. Well done! It's interesting the difference one changed vowel could make in that sentence. Based on empirical data, I only like anchovies if I'm in Italy. AluisioASG and yappo both ended the page of coma-molpies well with fantastic coma-molpies. AND... ergman's story was awesome! Hope it is merely the first of many installments to come! For ending the new page out with the most complete and intriguing story given during my reign of terror, I appoint you Sir ergman the elegant of 865. Now I need to ketchup 2 NPs. Valarya wrote: Yay! Cupcakess are in order! But I have to run to crossfit so I don't have time to google. Oh, meant to tell you that your 300-post animation was awesome! lmjb1964 wrote: And kenmelken, another amazing GIFt! Silly prediction: They steal the ark of the covenant and all the Nazis melt.